A heavily updated version of our benchmark sports sedan. This generation of C63 has long majored on excitement, with the best engine in its class, a charismatic exhaust note and a supremely talented chassis. AMG could have rested on those laurels, but has instead gone update mad with fresh styling cues, an updated interior and a host of hefty mechanical improvements. For all its strengths, the old C63 had a frustrating Achilles heel – it could be overbearing to live with everyday. This facelift looks to solve that. Headlining the changes are a new 9-speed gearbox, retuned suspension with greater compliance, and a suite of fresh driving modes, all of which promise improved speed and performance, and crucially, greater bandwidth in day-to-day driving. I DON’T EVEN have to leave the carpark to discover this updated Mercedes-AMG C63 S is an improvement in the one area it needed it most: ride quality. For all its goodness (bombastic V8 engine, absurdly talented chassis, a doddle to slide) the outgoing C205 C63 could be truculent to live with day-to-day. It was overly firm, even in its softest suspension setting, which is why I wince slightly as I approach a mean-looking, squared-off speed hump in this new car. But … hallelujah! No thumps, no nasty shockwaves, just a welcome dose of compliance. Nice. Better news is the fact that this newfound civility isn’t even the biggest headline in this heftier-than-most mid-life update. That goes to a new 9-speed gearbox – lifted from the E63 S – and to an armada of fresh driving modes and control systems. A ‘Slippery’ setting has joined the old car’s existing Dynamic Select modes (Comfort, Sport, Sport+, Race and Individual), and AMG has doubled down on customising the C63’s handling balance with something called ‘AMG Dynamics’. Essentially this controls the aggression of the rear differential and how it interacts with the stability control through four stages: Basic (no slip, normal driving), Advanced (swift progress, a little ESC leeway), Pro (fast back roads, small neat slides), and Master (bigger angles, more fun). If it all sounds a little dense and complicated, it can be, especially as there are now multiple ways to adjust and customise the settings, including new toggle switches that hang from the steering wheel spokes. These are fitted with tiny, customisable LCD touch screens that can alter the damping, diff, exhaust, engine and also operate the new 9-stage traction control system inherited from the flagship AMG GT R.
It can verge on tech overload, but take some time to familiarise yourself and it soon becomes intuitive. On a winding backroad, this new C63 is devastatingly effective. Outputs from the 4.0-litre V8 haven’t changed (375kW/700Nm), but the new gearbox’s additional ratios and ability to choose the right gear at just the right moment is a night and day improvement over the sometimes clunky old 7-speeder. The handling systems are deftly calibrated too, and do a brilliant job of making you quicker, and massaging your ego, without spoiling the fun or making the experience feel artificial. The 9-stage traction control is an interesting one, however. You activate it by disabling the ESC and using the wheel-mounted rotary dial (manettino style) to cycle from 9 (zero slip) to 1 (you’re on your own). But while it might be great on a track in order to achieve faster lap times, for fast road driving it’s more fun to drive with the ESP on and in Master mode. Then there’s that extra degree of bandwidth in the chassis. The suspension’s greater compliance is a boon about town, but build up speed on bumpy roads and you’ll soon find yourself dialling in Sport, Sport+ and even Race (a mode previously reserved solely for circuits) for greater control. Even withstanding the styling upgrades, like the addition of the Panamericana grille, and the generational leap inside (new steering wheel, digital instruments and larger central screen), this updated C63 is a significant improvement. It’s still as exciting and as hilarious as ever, but now has the depth and subtlety it needed to reach true greatness. Real world performance cars don’t get much better than this. Fast, exciting, and as charismatic as ever, the updated C63’s real masterstroke is how much easier it is to live with day-to-day. 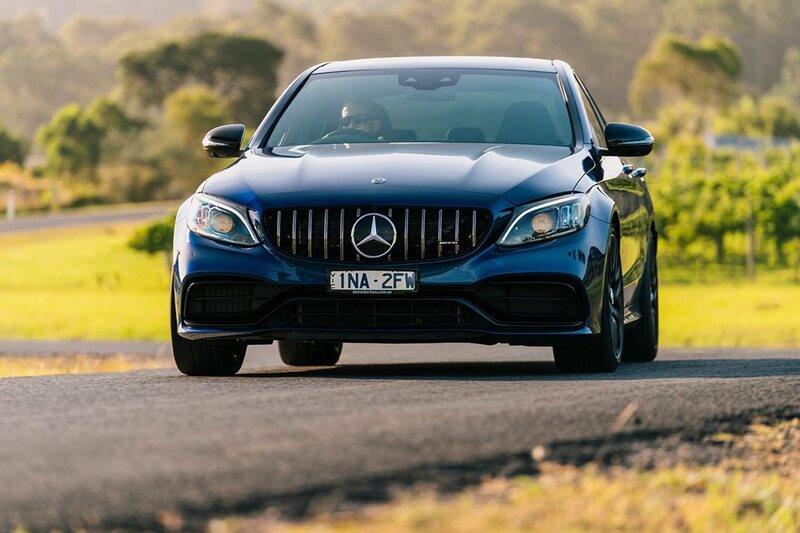 No other rival feels as special, or can offer as much bodystyle choice with the C63 available as a coupe, cabriolet, sedan and (our favourite) a wagon. Still the king of its segment.